Hypodermic needles have become more popular over the years, but some people find them more painful and challenging to use than other needles. This may be due to different factors, including which company you purchase the needles from and the size of the needle. Patients often need injection needles that are smaller in diameter and have a lower insertion point. These types of needles reduce the incidence of agonizing injections, often resulting in no pain at all. Directed by these observations, manufacturers are focusing more on fine needles, which have proven to minimize the pain of an injection and deliver vaccinations and insulin just as effectively. The reduced dimensions of the needles have resulted in less pain. In some cases, patients opt for needle-free techniques as the alternative, but this is not something that can be used in all situations. In 1853, Charles Gabriel Pravaz, a Frenchman, and Alexander Wood, an Englishman, both independently invented the hypodermic needle. Since that time, these medical needles have been commonly used in the medical community with approximately 16 billion administered injections globally. In comparison, vaccines generally require fluid injection of less than 1 ml, making 25- to 22-gauge injection needles that are 16–38 mm in length ideal. Because the delivery of insulin requires a smaller volume of fluid, patients are often able to administer the injection in a private daily setting. Therefore, this patient will benefit from an even smaller needle, which could be between 21 to 29 gauges to be inserted to a depth of 6 to 13 mm. Manufacturers are developing less painful injection needles because many people who suffer from diabetes must deliver daily doses of insulin on their own. With a motivation to produce medical needles that are less painful, there has been an increasing interest in smaller needles, and manufacturers are complying with the need. Progress is being made in the medical field as doctors and professionals find it easier and more reliable to insert smaller needles into the skin. Moreover, it is more cost effective to use smaller needles. Some companies have developed finer needles, sometimes less than 30 gauge, which are largely used for administering insulin. To further diminish pain from injection, manufacturers are making 31-gauge medical needles, which are between 1 and 3 mm in length. If you or someone you know must administer insulin or other fluids, check out our selection of hypodermic needles for medical use. A hypodermic needle is a significant player in the medical needle field, growing in popularity over the years. 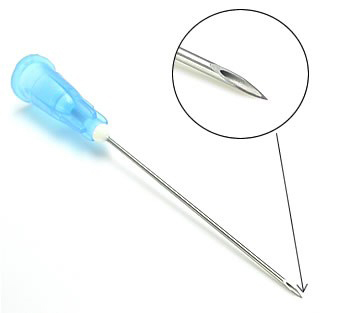 The needle is hollow, and is usually used with a syringe to either inject a substance into the body or to extract a fluid or liquid sample from the body. There are many benefits to using a hypodermic needle. Less pain for the user: Since hypodermic needles can be just as effective with a smaller diameter, many patients find that they have less vein damage, and subsequently, lower amounts of pain, when using a hypodermic needle. When purchasing a hypodermic needle, keep in mind that the smaller diameter needles will have higher gauge numbers. 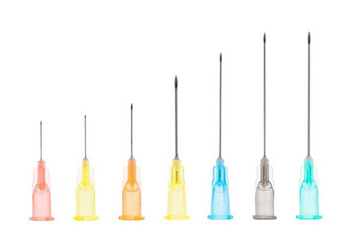 Variety of options: Hypodermic needles have three different types of bevel for the tip. A standard bevel is the longest option, while a short bevel and a true short bevel create a much shorter angled between the tip and the shaft of the needle. They also come in a wide variety of diameters, with 21-gauge being the norm when drawing blood for tests, and 16- to 17-gauge the standard for blood donation. The largest is a 7-gauge needle, and the 33-gauge needle is the thinnest.